A touch of Hollywood glam. Gold makes you think of glitter, of sparkles and jewels. Gold means special. Do you want your baby’s nursery to be truly one-of-a-kind? Go for the gold! 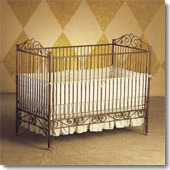 A gold crib is a veritable prize for today and an extraordinary treasure for tomorrow.